Can a 2-letter text message result in a flood of spam? Can you make your own Google Glass with cardboard, rubber bands and an Android smartphone? And does Wikipedia allow just anyone to change important facts on their website? Get answers to these burning questions, and the scoop on the latest tech news, in this edition of the Geekly Update. It's guaranteed to make you 146% smarter. Read, think and comment! Google Cardboard is Glass for the mass market, or an elaborate joke played by Google at its annual developers conference. But the do-it-yourself virtual reality headset for Android has its own Web page and app. You’ll need Velcro and a rubber band, NFC tag optional. Turns out that “Yo,” the Android app that lets you send that pseudo-word to a contact, is good for something after all. “We can get any Yo user’s phone number (I actually texted the founder, and he called me back. ),” brags one hacker. “We can spoof Yos from any users, and we can spam any user with as many Yos as we want. We could also send any Yo user a push notification with any text we want (though we decided not to do that. )” So whoa on the Yo, y’know? "But I read it on the Internet!" 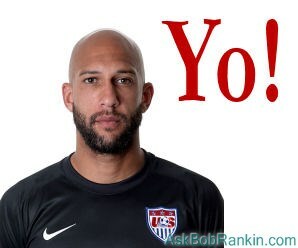 After stopping an amazing 16 shots in a World Cup soccer match, U.S. goalie Tim Howard was briefly declared the U.S. Secretary of Defense on Wikipedia. The Opera browser for Linux was finally upgraded last week. Both users had waited more than a year. More than 40 car washes across the U.S. have been used to launder money stolen from credit cards, says the Secret Service. All of the car washes used point-of-sale systems installed by the same vendor. The systems could be accessed remotely using Symantec PCAnywhere, and nobody changed the factory-default username and password. Some criminals take the phrase "money laundering" a bit too seriously. Leaving your WiFi network open for strangers to use can protect your privacy, according to Electronic Frontier Foundation activist Adi Kamdar, who’s pushing the EFF’s new Open Wireless bandwidth-sharing initiative. “Open wireless makes mass surveillance and correlation of person with IP more difficult, and that’s good for everyone,” he spins. Yes, but it can also make it easier for you to be accused of crimes you didn't commit. Over 300,000 servers are still vulnerable to the Heartbleed exploit, two months after the IT world went nuts about the biggest Internet security hole ever left unpatched for a decade. YouTube plans to add 60 frames-per-second capability, which will help content producers who offer fast-action clips. Also, a “tip jar” tool will enable fan funding. Indie music makers are protesting YouTube’s contract terms for its forthcoming subscription streaming service. A leaked copy of the contract confirms that YouTube wants indies to automatically give up part of their royalty rate if any major record label agrees to a lower rate. YouTube says it will soon start scrubbing its site of content providers who don’t agree to these terms. The German government is dropping Verizon as a service provider due to fears of NSA spying. All services currently provided by Verizon will be shifted to Deutsche Telekom by the end of 2015. "We do a fine job of spying on our own citizens, thankyouverymuch." Most recent comments on "Geekly Update - 2 July 2014"
Love the concept of sharing your wireless bandwidth as being like offering neighbours and visitors a cuppa. I can see this idea catching on and I for one would be a starter. However as always it will probably take the legal side a few years to catch up with the new concept. Recently I was in hospital for a hip replacement and discovered the hospital had several wifi networks running, including one open and free for the use of patients and visitors. And this wasn't a private hospital but a public one here in new Zealand. It was a life safer for me as I recovered from the operation. Bob, I want to thank you for, checking out the "Yo" app further. We both know that, there will be "dumbheads" out there in Cell Phone Land, that will download this app and not even be aware of the harm they are doing to themselves or others!!! I am still "out" on my decision, about your Broadband Company allowing your Cable or DSL Modem or WiFi Card to be used by passer bys. Especially, if, they are NOT going to "charge" for this service!!! This companies are charging the holy sh** out of most of us, so why, should we "share" our Broadband width, with strangers???!!! Now, I know that the broadband strength goes down, when someone other than the main person, uses your broadband Wi-Fi. I carry enough broadband width, to cover this, for me and my family members. The first to be considered in my home, is my Hubby and me, our computers. Then, when my family comes over, I have authorized them to be covered on their SmartPhones or Tablets. Again, I say, I have plenty of broadband width, to cover us and them.